Luckily, Sunny isn’t the only kid around. She meets Buzz, a boy who is completely obsessed with comic books, and soon they’re having adventures of their own: facing off against golfball-eating alligators, runaway cats, and mysteriously disappearing neighbors. But the question remains — why is Sunny down in Florida in the first place? The answer lies in a family secret that won’t be secret to Sunny much longer. . . 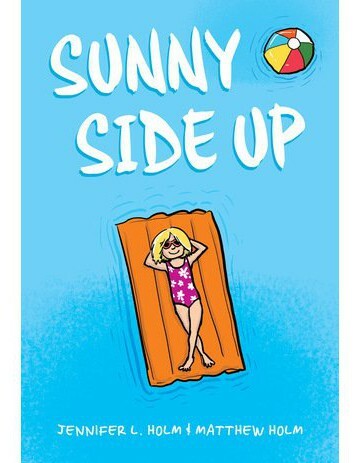 This is a fun, straightforward middle grade graphic novel about dealing with addiction. The book is set in 1976, and I’m not completely sure why (other than that’s probably when the authors were growing up), but the lack of technology definitely drives home Sunny’s boredom in Florida: there’s no cell phone, ipad, internet, or even cable to distract her. 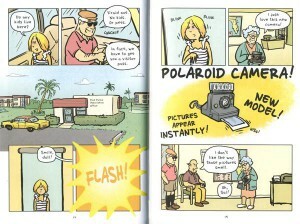 Periodically, Sunny’s attempt at forgetting her feelings about her brother and overcoming her disappointment manifests itself in panels exclaiming the features of an object, in the style of commercials from around that time period. 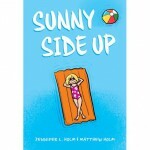 It’s clear early on in the book that something is up with Sunny’s older brother–both from the flashbacks, and from how she consistently avoids speaking of him (when asked if she has siblings, Sunny only mentions her baby brother). While the main story takes place in August 1976, it’s interspersed with short scenes from the past year. In each scene, Sunny’s teenage brother Dale has a worse and worse attitude, and seems to be falling deeper and deeper into alcohol and drugs. On top of that stress, Sunny’s grandfather (who she’s staying with in Florida) is smoking again, against doctor’s orders, and Sunny keeps finding his cigarette packs all over the apartment. 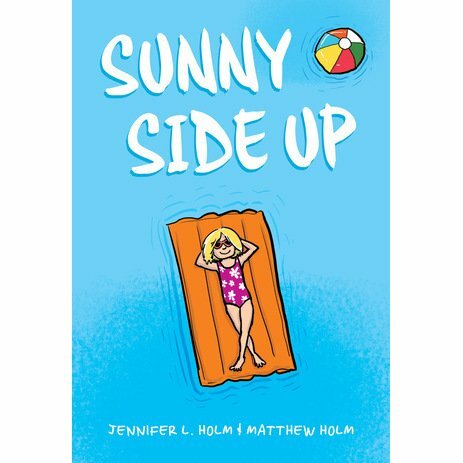 Both experiences force Sunny to grapple with her role as a ten-year-old when she sees the people she cares about do dangerous things. Does she back up Dale’s lies? Does she pretend she didn’t see that pack of cigarettes in the freezer? What are you supposed to do when you’re old enough to understand what’s going on, but too young to do anything about it? These are important questions, and ones that middle schoolers–especially 6th graders–find themselves dealing with. While the book addresses difficult issues, it’s overall upbeat and optimistic. The authors make good use of the graphic novel art form: there are many instances where a wordless panel, or a sequence of wordless panels, makes a big impact. If your school has some kind of DARE or another kind of anti-drug program, this would be a good book to integrate into the program in some way, or to read and discuss with your students alongside the program. It’s not preachy at all, even though it’s very clear that the book (and Sunny) view Dale’s behavior as unambiguously negative and destructive. Since we only view Dale from Sunny’s perspective, we don’t know what his motivations are, so that would be a good thing to explore with students. Why does Dale make the choices he makes? From what we see of Sunny’s family, her parents seem caring and reasonable, so what else could be going on in Dale’s life? This book is a great argument for keeping graphic novels in your classroom library. Because pictures do a lot of work to tell the story, instead of only words, the AR level is often lower than it would be if the book were a novel. This allows graphic novels to take on difficult, complex topics–ones that appeal to middle schoolers–while being accessible to struggling readers. Moreover, since graphic novels in general don’t have a stigma as being “baby books” (at least not at my school), they’re great equalizers. I’ve also found that a lot of my boys who are struggling readers LOVE graphic novels that have female protagonists and appear stereotypically “girly.” Raina Telgemeier’s books are particularly popular with both genders. I’m not sure if these boys would pick up a novel as coded as “being for girls” as Telgemeier’s books are, but they argue over who gets to read Sisters next. In any case, I would gauge the content in this book to be appropriate for 4th and up. If you have a younger student who you know is dealing with similar issues, though, this would be a good book to share and discuss with them.